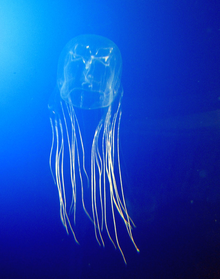 The Cubozoa, the box jellies, contain some of the most dangerous jellyfish in the phylum Cnidaria. They make up a small class of Cnidarians, with only 19 species. It is their powerful venom which makes them noteworthy. All cubozoans have four 'legs' (pedalia) hanging from the corners, from which hang tentacles. They have a rudimentary neural network. The cubozoans can move through the water to actively hunt prey, and have a degree of sight as they have up to 24 eyes. Cubozoans have two main eyes on each of the four pedalia, each with a lens, retina and cornea; and some species also have eye-spots as well. The box jellies are found in tropical oceanic waters round the world. Their venom is delivered by stinging nematocysts, which cluster on tentacles, each with half a million stinging cells. The largest species, Chironex fleckeri, has caused many human deaths. The pain of an attack is agonising, and heart failure is a danger. The attack can be treated: first with vinegar, then remove stingers, then apply anti-venom. ↑ Gershwin L. 2005a. Taxonomy and phylogeny of Australian Cubozoa. PhD, School of Marine Biology and Aquaculture, James Cook University, Townsville, Queensland. ↑ Fenner P, Williamson J, Blenkin J (1989). "Successful use of Chironex antivenom by members of the Queensland Ambulance Transport Brigade". Med J Aust 151 (11-12): 708–10. PMID 2574410. ↑ Fenner P (2000). "Marine envenomation: An update - A presentation on the current status of marine envenomation first aid and medical treatments". Emerg Med Australasia 12 (4): 295–302. doi:10.1046/j.1442-2026.2000.00151.x. This page was last changed on 17 March 2018, at 08:41.